« Have you ever thought how “Bluetooth” got it’s name? Once again I have resurrected an older post which I believe is still extremely relevant this year as it was towards the end of last year. What I am a little disappointed in is that there are people that have not heard what is being said! Before you embark upon any business improvement in 2014, make sure that you know where you want to go and understand the implications of your actions. Without moving as one, you will surely fail. Don’t lose direction! What is the latest buzz in the supply chain world I was asked at a recent SAP Conference, I replied there is plenty of buzz in the SCM world but all this hype needs to be underpinned by a good solid supply chain strategy. Have you heard of the “Sardine Strategy” ? the questioner looked perplexed at my question! I will elaborate for schooling fish, staying together is a way of life. 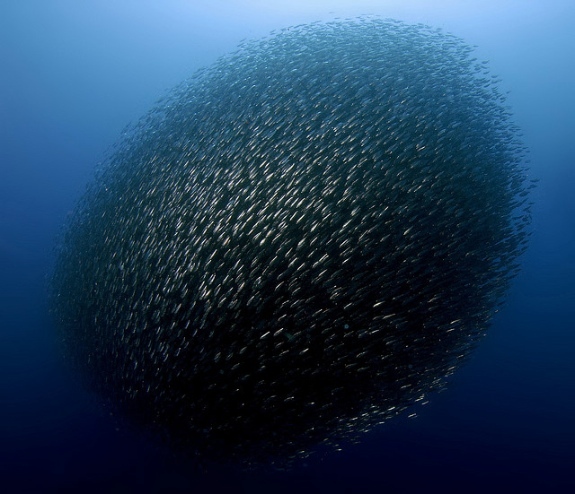 Fish in a school move together as one, for schooling fish the “move as one” trait is innate. Separation means likely death! For Global Supply Chain, misalignment – failure to move as one – means poor service, high inventory, unexpected cost, constrained growth and profits, finally resulting in loss or market share and possibly reputation. Once market share and reputation have been damaged they are difficult to repair. So what are the common causes of misalignment – failure in supply chains to “move as one”? I offer a list of some 15 common causes that have plagued companies for many years and still do today, I am sure that the list is non exhaustive, but I am doubly sure that the readers can equate to one or more of these businesses today. 1). Lack of Technology investment plan. 4). Competing supply chain business improvement projects. 5).Faulty sales and operations planning. 6).Failure to meet Financial Commitments. 7).Lack of support and specialized expertise. 8).Mismatch between Corporate Culture and ERP. 9). Under utilization of existing technology. 11).Impact of mergers and acquisitions. 12).Mismanagement and poor standardization of business processes. 13). Extension from supply chain to the value chain. 14).Running out of ideas for new improvement projects. 15).An organisation that defies effective and efficient supply chain. This entry was posted on November 19, 2013 at 9:00 am and is filed under Supply Chain Management. You can follow any responses to this entry through the RSS 2.0 feed. You can leave a response, or trackback from your own site.